I have to say that this meal is probably one of my favorite recipes to pull out on a given night. The recipe for the rolls is one that I have been making for decades and is both delicious and forgiving, which immediately makes it “fabulous” for me. The kielbasa is another component that is easy when trying to make a quick, healthy dinner that will please all the picky eaters in my house. I’ve been making both of these things, together and apart, for so long that I was astounded to find that I’d never posted the recipe before. Please forgive my error and let me rectify this as quickly as possible! I use my bread machine to make the dough for this. If you don’t have a bread machine, I’d suggest finding a basic bread dough recipe and following those instructions because I truly haven’t made bread without the machine for so long that *I* would have to look up “how to make bread dough” if I were going to make this recipe without the machine. Once the dough is made, you’ll want to section off equal size pieces of dough and form them into rolls. For a full recipe, I typically make 9-12 rolls, depending on how large I want the rolls to be when I’m done. If I made a half recipe, I like to get 6 rolls out of the dough… everything depends on how big and what shape you want your rolls. When forming the rolls, I like to pull the dough from the top of the ball and squish (technical term, right?) it into the bottom so I’m forming a very round ball. I then pull the dough out from the center and stretch the roll to make it “flatter” and wider. Once formed, I place the rolls onto a greased cookie sheet and allow them to rise until doubled (maybe a half hour or so). Bake the rolls in a pre-heated 375* oven for 10 minutes, turn the rolls around in the oven and bake for another 10 minutes. They should be nicely browned and come off the pan easily. NOTE: I spray the rolls a few times (once going in, once inside the oven, and again after turning the rolls) with ice water. I’m honestly not sure what this does, but my original recipe told me to do this, so I continue to do so. The crust doesn’t get too crispy and the rolls are puffy and light. I like to first saute’ the onions in some variation of fat, until they’re lightly browned and toasty. If you want to do a full-on caramelization of the onions, go for it… they’ll be a terrific addition. It’s all about what you’d like to have with your dinner. Slice the kielbasa into “pennies”… I cut them slightly off kilter, so they look pretty, but it’s all about what works for you as the chef. I’ve cut them into long slices, but the kielbasa tends to curl up so the “penny” shape works better for me. Add the kielbasa into the pan and season with garlic, salt and pepper. Saute the kielbasa pieces thoroughly on one side before flipping them over and browning on the other side. Once the kielbasa and onions are cooked thoroughly, I like to add some white wine to add a bit of a sauce to the pan. The wine picks up the browned bits and adds a nice back note to the meal. You certainly can omit this step and still have a delicious dinner… it’s all about what you’d like to make and how you’d like it to taste. I hope you’ll consider trying this recipe sometime. I love to keep turkey kielbasa in the freezer for that day when I want to make dinner but don’t have a ton of time… this meal fits the bill for me! Enjoy and let me know if you have any questions or comments… I’d love to hear from you! 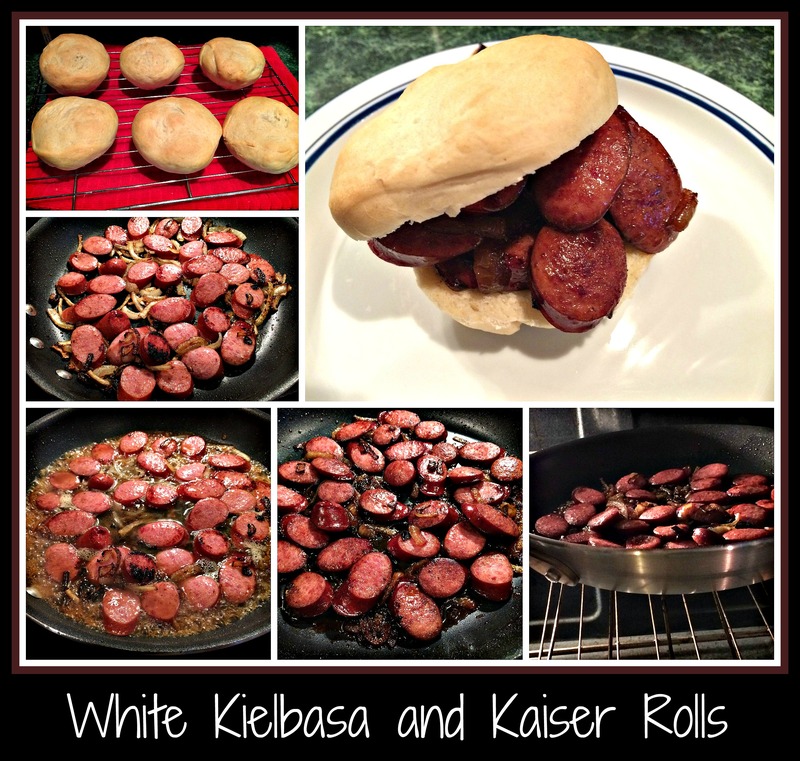 This entry was posted in cooking with wine, dinner recipe, easy recipe, white wine, Wine and tagged Kaiser roll, kielbasa, onions, rolls, white wine.